The Agilent N6700 IVI-COM/IVI-C driver from Agilent’s website. If you get the driver from somewhere else, I am not sure how it will work. Once you have all of this, you are ready to get started. After that, you want to go to the "IVI-Drivers" menu, select the "Driver Sessions" item and right click on it to select "Create new". From there, click on the "software" tab and select the appropriate driver, in this case the AgN67xx driver. You can see here that the driver complies to the IviDcpwr class whcih is what we will be using. One thing that I cannot stress enough is that you need to check that checkbox. In you don't, this will not work and you will spend a little bit of time trying to figure out why you are getting resource not found errors. Believe me I know this from experience! After you double check everything make sure that you click on "Save IVI Configuration". Make sure to click on "Save IVI Configuration" again. With that, you are ready to actually start! I used Visual C++ 2010 to write my example. Make sure that you have all of the IVI directories properly entered in your project. Also make sure that you reference the ividcpwr.lib file in your "linker" settings. // enables the output, and measures voltage and current. You need to include "IviDCPwr.h". All the functions are in there. You do not need to reference the instrument specific driver. When you initialize the unit, you can refer to it by the name that you define in the "Logical Names" tab above. In my case, I use "MPS". This is a modular power supply. The variable "index" is controlling the channel. I have tested this program and it works properly. In theory, you should be able to swap this power supply out with another class compliant power supply with minimal programming changes (though in this case if you switch to a single output supply you would need to take out the references to the multiple channels). One last thing that I want to note is that this will be the last Watt's Up blog posted under the Agilent banner. Don't worry, we will still be posting the same great content but it will be under a Keysight Technologies banner. I have been working for Agilent for 14 years now so it will be odd at first to have a new name but I am looking forward to posting many more blogs as a Keysight employee. 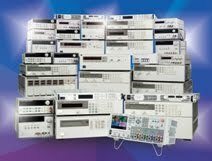 Goodbye Agilent Technologies it's been an interesting 14 years! Thank you for this post! Think you might be interested in this information as well.